If living in good health for as long as possible is important to you, then LivingTheCRWay has delicious recipes that belong on your holiday table. These are not pseudo-healthy concoctions that send blood sugar soaring. This is cutting-edge science, delivered in gourmet fashion. The point: to make reaching a level of health most people only dream of deliciously easy. 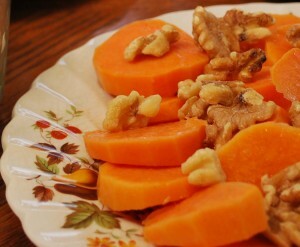 Slice deep-orange, sweet potatoes into 1/4-inch medallions. 2 teaspoons ginger, cardamom, or cinnamon have been added. Sprinkle with lemon juice to preserve their beautiful orange hue. Within minutes, this appetizer is ready to delight the palate and to build toward greater health. Enjoy this sensual mushroom delight as a hearty soup or over barley. It features portabellas, which even dyed-in-the-wool meat eaters will enjoy. Chocolate, the world’s favorite flavor, combines with seasonal cranberries and delicious sprouted grain bread. Even with no sugar added, this tastes like dessert. A little red wine is optional. To experience the life-giving potential of extraordinary health, visit LivingTheCRWay, the evidence-based haven for those who want to extend healthspan. Become a free Healthy Start member to access cutting-edge blog and forum posts and to learn about the science behind the benefits. Or support research by choosing a full membership that fits your goals: Healthful Weight Loss, Brain Booster, Diabetes Intervention, Optimal Health, or Longevity. The CR Way is guided by scientists, doctors, and other world-leading experts who hold live teleconferences for LivingTheWay.com members. Memberships support CR Way DNA HACR, a citizen science study open to all who want find out what they can do to slow or reverse aging.